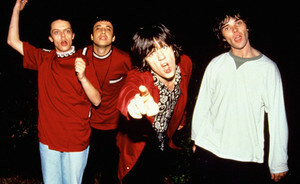 It has been confirmed that The Stone Roses documentary “Made of Stone” will open nationwide on June 5th. This film was made by director, Shane Meadows and it goes behind the scene on The Stone Roses’ 2012 reunion, from the early stages to their hometown shows at Heaton Park. This event will be satellite-linked to over 100 cinemas for nationwide preview screenings. These preview screenings will run concurrently with the premiere launch and tickets for the host venue and satellite-linked cinemas will be available to the public. The film premiere, which will have all of the band members in attendance, will be on May 30th at Manchester. Fans who attended last year’s Warrington Parr Hall and Heaton Park gigs who are featured in the film will get tickets to the premiere in Manchester. Meadows had filmed The Stone Roses for about a year from their reunion press conference in October 2011 to their performances in August 2012. This film will include scene of early rehearsals in a barn and footage of The Stone Roses’ comeback shows in multiple locations. Paul McCartney has revealed plans for a 2013 tour called, Out There! McCartney has only confirmed two dates so far which are at the National Stadium in Warsaw, Poland on June 22nd and at the Happel Stadium in Vienna, Austria on June 27th. McCartney was said that more dates will be announced soon. There has also been mention that Paul McCartney is currently working on a new studio album. McCartney will be headlining the Bonnaroo Festival in Manchester, Tennessee this summer. Paul McCartney & Wings will be releasing a live version of Maybe I’m Amazed on 12-inch vinyl for Record Store Day on April 20th. The Strokes are preparing to release their new album, Comedown Machine, on March 26th. To pre-order their new, upcoming album, be sure to go to: http://www.myplaydirect.com/the-strokes. The Stroke’s fans can now stream the entire album on: http://pitchfork.com/advance/48-comedown-machine/. Check it out! Noah and the Whale have released the video for their new single called, “There Will Come a Time.” To view the video, visit: http://www.nme.com/news/noah-and-the-whale/69332. This song is taken from Noah and the Whale’s new album, Heart of Nowhere, which was recorded in West London’s British Grove Studios. Noah and the Whale will play many shows across the UK for this summer. The complete list of shows that they will play includes: Bournemouth O2 Academy (April 27th), London Palace Theatre (April 28th), Bexhill De La Warr Pavillion (May 1st), Liverpool Sound City (May 2nd), Warwick Arts Centre (May 4th), London Palace Theatre (May 5th), London Palace Theatre (May 12th), Manchester Opera House (May 13th), London Palace Theatre (May 19th), Hay-On-Wye Festival (May 23rd), and Wilderness Festival (August 11th). To check for the availability of tickets, be sure to visit: http://www.nme.com/tickets. Fall Out Boy have revealed that they will be performing at L’Olympia Bruno Coquatrix in Paris, France on August 20th. Tickets for this show can be purchased by going to: http://www.olympiahall.com/rock-electro/fall-out-boy.html. Fall Out Boy will also be touring in the United States this summer. To see a complete list of their tour dates, visit: http://www.altpress.com/news/entry/fall_out_boy_announce_august_paris_show. Paramore have revealed that they will embark on a South American tour this summer which will take place across Chile, Argentina, Paraguay, and Brazil. Tickets for this tour are set to go on sale in April. To watch Paramore’s tour announcement video and to see a list of complete tour dates, visit: http://www.altpress.com/news/entry/paramore_announce_south_american_tour. The Postal Service have announced an unheard song called “Turn Around”. To listen to this track, be sure to visit: http://www.nme.com/news/the-postal-service/69340. This song is one of two new songs that will be featured on the 10-year anniversary of their only album, Give Up. The re-release of this album will include a second disc which has the songs “A Tattered Line of String” and “Turn Around”, along with the album’s original ten tracks. The second disc will include live recordings, remixes, and covers. The Postal Service have revealed some UK tour dates and they will also play Coachella on April 13th and 20th, along with Barcelona’s Primavera Sound Festival. Ellie Goulding’s track, “Anything Could happen has been remixed by Mt. Eden, as hefty drum and bass jolts have been included on the track. This song is available for a free download and can be downloaded at: http://www.dancingastronaut.com/2013/03/ellie-goulding-anything-could-happen-mt-eden-remix-free-download/. Prince has announced a 28-date West Coast tour that will be spanning over 23 days. Prince has booked these shoes in small club venues and he will perform in seven different clubs in seven different cities. Prince will also be playing an early show and a late show on each date of the tour. To view the complete list of dates for this tour, be sure to visit: http://popcrush.com/prince-west-coast-tour/. Kip Moore has recently released a video for his latest single, “Hey Pretty Girl”. In regards to the song, Moore had mentioned that the whole song is about hope and what one hopes to experience with somebody. To watch the new video, be sure to visit: http://latenightjimmy.tumblr.com/post/45674404975/web-exclusive-premiere-kip-moores-hey-pretty. This entry was tagged Ellie Goulding, Fall Out Boy, Kip Moore, Noah and the Whale, Paramore, Paul McCartney, Prince, The Postal Service, The Stone Roses, The Strokes. Bookmark the permalink.